If you are looking for an easy recipe that can be made without a hand or stand mixer this is it! This recipe requires only a cake mix, melted butter, one egg, and food coloring – all of which can be stirred with a wooden spoon inside one (or two) small mixing bowls. 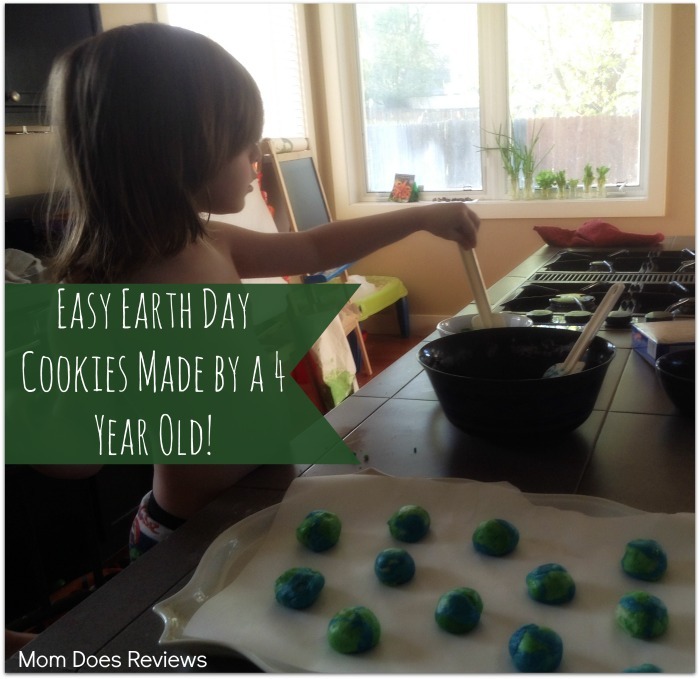 It is so easy that my four year old made these cookies (with a little help, of course). This is a common cake mix cookie recipe and is our go-to snack around the house. Melt 6 tablespoons of butter and beat one egg. Pour the egg and butter into a mixing bowl with one package of BOX CAKE MIX. Stir until combined. Once the cookie dough is prepared, separate the dough (almost in half). Add blue food coloring to the larger “half” of dough and green food coloring to the rest. Now you will begin making your Earth cookies. We made ours with a small ball of blue dough and added three small pieces of green dough to the outside. Roll into a ball and place on parchment lined baking sheet. Because my preschooler and I made these together we didn’t get specific with our land placement. If you have older helpers, I would encourage them to do the best they can while discussing the water to land ratio of the Earth, how many continents we have, etc. Combine cake mix, butter, and egg in small bowl until all dry ingredients are incorporated. Separate dough into two parts. In separate bowls, dye one-half of the dough blue, and the other green. Take 1/2 tsp of blue dough and roll into a ball. Pinch two or three small pieces of green dough and place them anywhere on the outside of the blue ball of dough. Roll one more time. 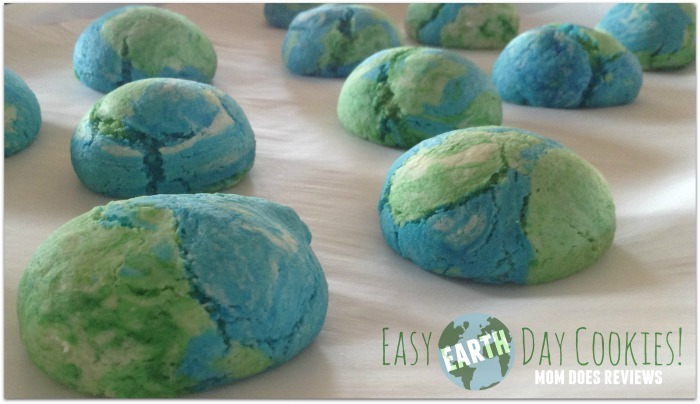 Place dough “Earth” onto lined cookie sheet and baked for 10 minutes. Note: Cookies don’t need to be pressed down or overly spaced as they will fluff up more than they will out. Pressing down on the dough ball will also prevent them from being dome shaped. 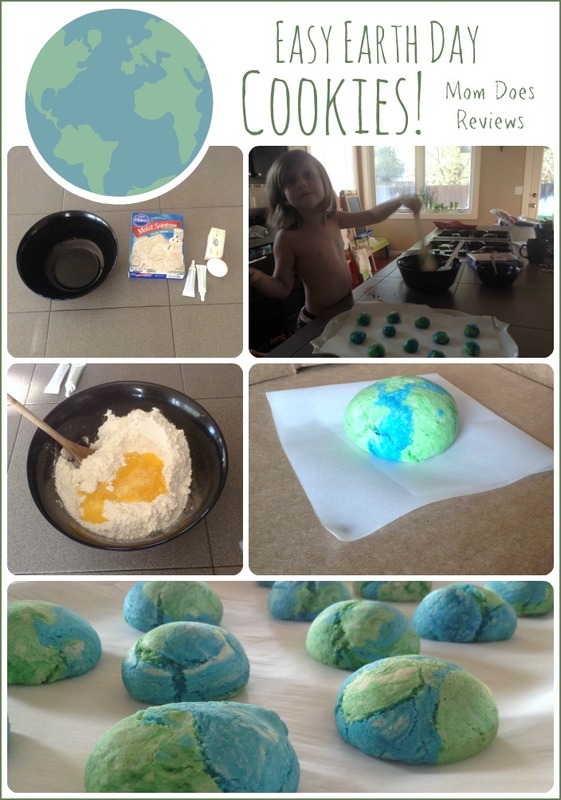 Looking for a cute Earth Craft to go with your cookies? Check out this adorable Earth Day Mascot printable HERE. What plans do you have for Earth Day this year?